The rumored official analytics product for and by twitter has apparently launched today with a select group of Twitter users getting invited to join. While there are already 3rd party apps that will give you some analytics for twitter, none of them will be able to provide the level of accuracy that an official tool by twitter can. 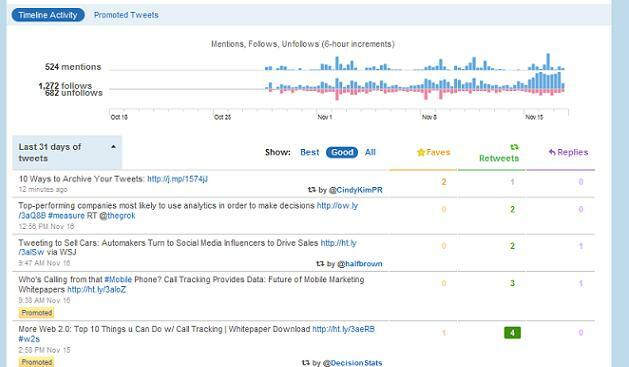 The new analytics tools will allow users to see which tweets cause other people to stop following you, who the most influential people are that reply and retweet your tweets, and which tweets are most successful. These are obviously just some of the data available. So What? Why Should My Small Business Care? As marketers we really love the trackability of the web. In fact, we focus almost solely on the web for our small business marketing clients because of the data that is available. It's so easy to produce an ROI number and gauge effectiveness. With these new tools from Twitter, it will be even easier to see it's benefit to small business marketing mixes. We're excited to get a chance to use the tools a bit and will certainly post a follow-up when we've had the chance to play with them.